Our manufacturing plant packs cardboard pallets in stacks. The maximum quantity in a semi-trailer type truck is pallets or stacks. We also have the possibility to deliver you by trailer with a larger quantity which will reduce logistics costs. For our product Pallet Carton 600 X 800 X 100 - 2 entries, our minimum order quantity is only pallets. The dimensional category is 600 X 800 or a "1/2 pallet". Before shipping, each stack of cardboard pallets is wrapped and protected from air, dust and moisture. As from the validation of your order, the delivery time normally noted of your order is 5 working days. For large quantities (full truck for example), we specifically manufacture your order in Pallet Carton 600 X 800 X 100 - 2 entries. The delivery time is then generally between 3 and 4 weeks after receipt of your order. Our pricing conditions allow us to offer you the delivery of your "cardboard pallets" in metropolitan France at Franco prices directly from our website via the "add to cart" function. 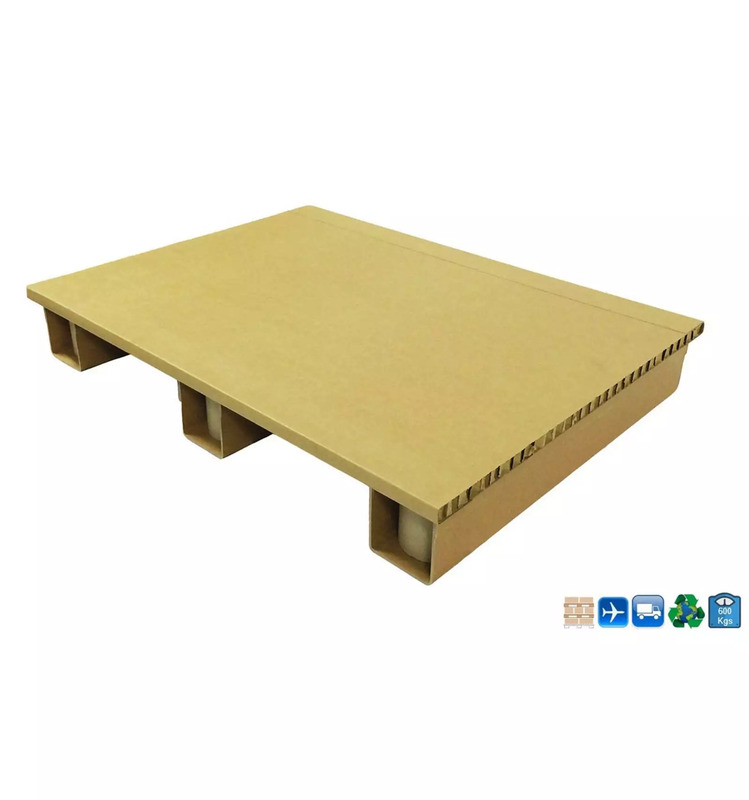 The exteranl dimensions of the cardboard pallet are 800 mm long, 600 mm wide and 100 mm high. It is a pallet which has 2 way entry, i.e. you can handle your pallet with a forklift truck or a pallet truck by the 2 sides. Our Pallet Carton 600 X 800 X 100 - 2 entries weighs less than 2.5 kgs, it resists a dynamic load of 600 kg and static load of 600 kg. You can find all the details of the characteristics by downloading our specifications found under the tab " Technical Sheet " in French or in English. The Cardboard Pallet 600 X 800 X 100 is not affected by the ISPM15 regulation for the heat treatment of wooden packaging and pallets. The relative humidity of the plastic pallet is 10%. This rate avoids all the inconveniences of contamination and rising humidity by capillarity on your boxes during the deliveries of your products unlike wooden pallets. For your exports, we can, on simple request, communicate you a certificate of conformity. All countries adopting the terms of the IPPC-ISPM15 Convention accept cardboard pallets recognised as not transmitting insects or parasites. On your request, we can study the possibility of marking the cardboard pallets with your mark / logo, your brand or other inscriptions according to your needs. The Pallet Carton 600 X 800 X 100 - 2 entries, must be stored indoors. When storing for a long time, it is preferable, to preserve all its properties, that the cardboard pallets are stored sheltered and in a dry place. Loaded with your products, it is advisable to store them in a sheltered, dry place. We would like to draw your attention to the fact that prolonged exposure of cardboard pallets to a high moisture content can lead on the one hand to deterioration of the latter and on the other hand considerably reduces its resistance characteristics. This cardboard pallet can be stored in rack: No / No with a maximum load of 0 kg. 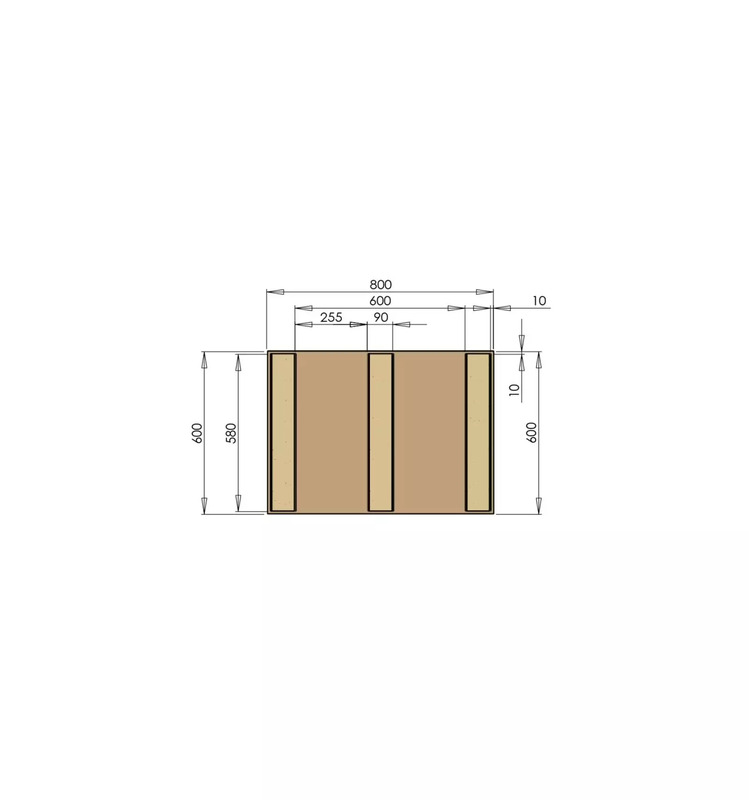 The cardboard pallet is handled with an electric or manual forklift truck or pallet truck. The transport conditions are identical to those generally applicable to pallets. However, it is recommended to pay all necessary attention during handling and avoid excessive and repeated shocks. The precautions for use are only associated with your handling conditions and the condition of the soil during transport. If you hit the plastic pallet with the forks of a forklift truck, these can seriously damage the structure of the pallet and alter the load resistance conditions. When handling by hand, we strongly advise you to wear suitable safety gloves. Our 600 X 800 X 100 Carton Pallet - 2 entries, is produced according to strict quality criteria using duly controlled and high quality raw materials. Corrugated or honeycomb cardboard sheets come from the recycling industry. The "cardboard pallets" are very resistant and very light, consisting of a reinforced cardboard tray and pallet feet covered with kraft. Our cardboard pallets are produced from the recycling circuit and contain only recycled cardboard. 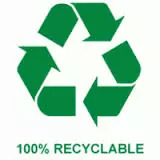 As a result, it is also fully recyclable (100%) in the cardboard industry.